You’ll take your next holiday at an average speed of 6 km per hour if you opt for a licence-free rental boat. You’ll thus be able to take your time and follow your whims, delving into everything you encounter along the way. Take advantage of your deck to interact with other boaters, fishermen and even bargemen during your cruise. 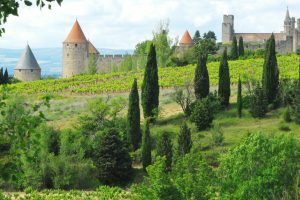 You’ll appreciate the warm, enchanting climate of this region in the South of France. 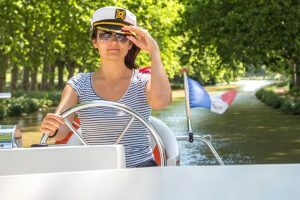 A successful waterway cruise from our bases in Aquitaine or Languedoc promises you the Dolce Vita on the water! 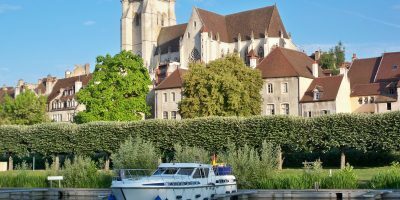 From Colombiers As the European waterway tourism specialists, we recently inaugurated our new base in Colombiers, so come and start your cruise by visiting us at this small traditional port. From Homps The town of Homps developed over the centuries in the Minervois wine-growing area, and was transformed during the construction of the Canal du Midi. This canal features on the UNESCO World Heritage list and awaits you for an unforgettable waterway river cruise. 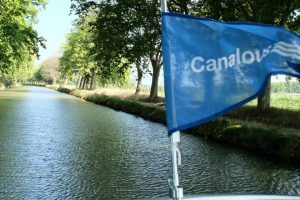 From Carnon Opt for the Camargue and embrace the enchanting climate of the South of France to sample the joys of waterway tourism. We await you in Carnon as you take the helm of your licence-free rental boat. 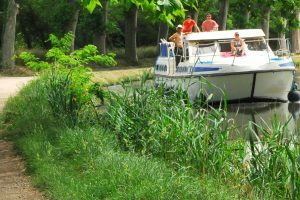 From Agde After marvelling at the round lock of Agde, you’ll be able to wonder at the many locks and other works of art that embellish the 240 kilometres of the Canal du Midi, classified as a UNESCO World Heritage site. From Carcassonne This préfecture of the Aude département is famous worldwide, as attested to by its double UNESCO world heritage classification since 1997. Tourists flock to admire the fortified medieval city, which is still inhabited. 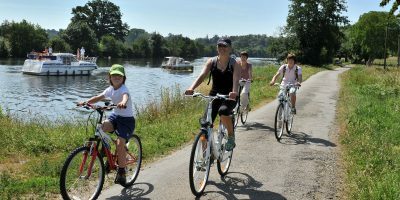 From the Canal Latéral de la Garonne to the Rhône-Sète Canal, itin­er­aries abound, allow­ing every­one to hap­pi­ly indulge in their favourite activ­i­ties. Under the Mediter­ranean sun, bright­en up your cruise with a cycle ride along the banks of the Canal du Midi. Head for Gas­cony and your stop­ping points will be great oppor­tu­ni­ties to indulge in the plea­sures of local gas­tron­o­my. 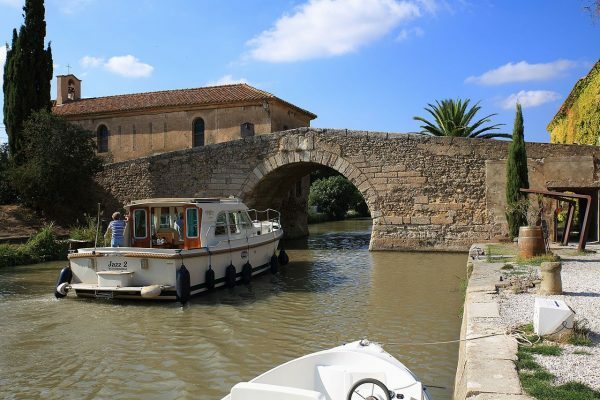 Cul­tur­al tourism is also on the agen­da, as you take your licence-free rental boat through Cathar coun­try or admire a mas­ter­piece of engi­neer­ing : the Agde round lock. Whether you’re look­ing for a cul­tur­al hol­i­day or sporty get­away, a fam­i­ly cruise or boat­ing adven­ture with friends, Les Canalous will help you organ­ise your water­way cruise to suit everyone’s pref­er­ences. 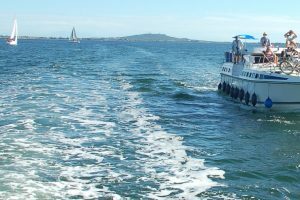 You choose the boat on which you’ll spend your next trip (from the Pre­mi­um to the Low-Cost range, you’ll be spoilt for choice), and we’ll help you put togeth­er your itin­er­ary. Whether you go for a few days or sev­er­al weeks, it’s up to you to let your­self be guid­ed by a sin­gle mot­to : Head South with Les Canalous ! 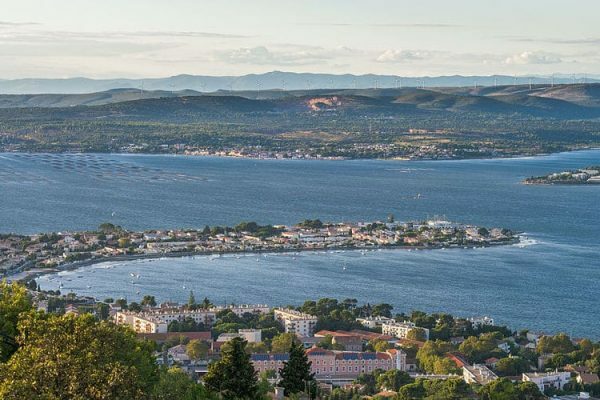 We want you to have total free­dom of choice, and there­fore offer a vari­ety of water­way bases in the South of France. From Agde to Fourques sur Garonne and Carnon to Car­cas­sonne, set off between Aquitaine and the Camar­gue and dream up the ide­al hol­i­day itin­er­ary for your whole crew. 1 / 5 Etang de Thau Etang de Thau is Languedoc’s largest lagoon (19 km long and 5 km wide). This natural resource has given rise to a series of artisanal activities: mussel and oyster aquaculture. These are facilitated by the diversity and abundance of phytoplankton fed on by these molluscs. This abundance is due to the moderately deep, warm and slow-moving waters. 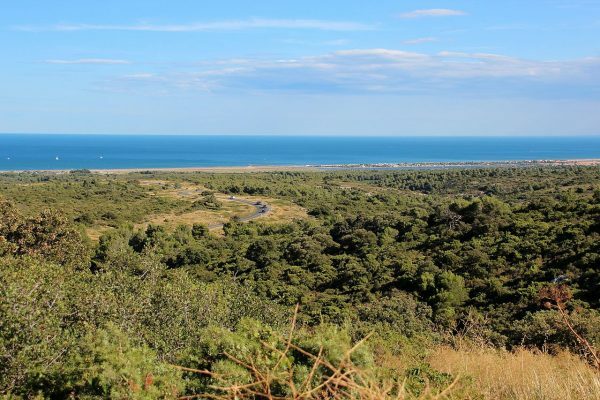 Thau is a veritable inland micro-sea with exceptional biological diversity! the ice house – the only remaining ruin of the Canal. This is a small vaulted building with a circular layout on two levels, separated by a floor. 3 / 5 Narbonne and its beaches The beach at Narbonne-Plage extends for 5 kilometres and is a good hundred metres wide – a large enough area to allow various team games to be played, such as volleyball. The beach is supervised during the day in summer and access is free. Narbonne-Plage is also known for its large marina, marking the resort’s north-eastern boundary with Saint-Pierre-la-Mer. It has a 600-unit capacity, was built between 1981 and 1986 and has been awarded the ‘Clean Ports’ label since 2016. 4 / 5 Camargue: Fauna and Flora The richness and specificity of the Camargue’s vegetation derives from the dual influence of water and salt. Irrigation water softens the north of the delta, while seawater introduced to the south for salt production increases soil salinity. Halophilic plants are predominant in these conditions since they adapt well to salty environments. Samphire, growing in small bushy clusters with green foliage, is most representative of the Camargue. Located on the migration route between northern Europe and Africa, the Camargue is an important migratory stopover for many water birds and ducks, making it an outstanding birdwatching site. More than 150,000 birds, representing over 250 different species, travel through the Camargue during their migration or live here throughout the year. 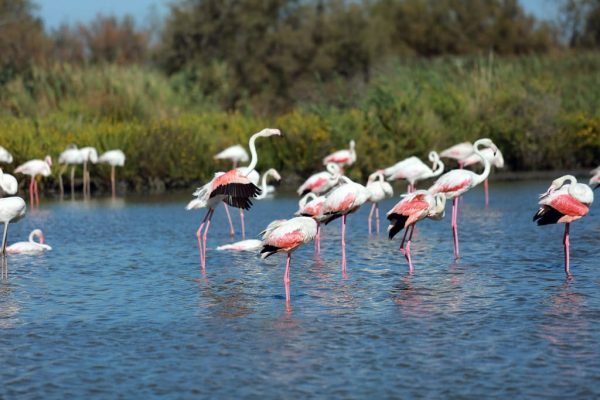 The species most representative of the Camargue is the pink flamingo! 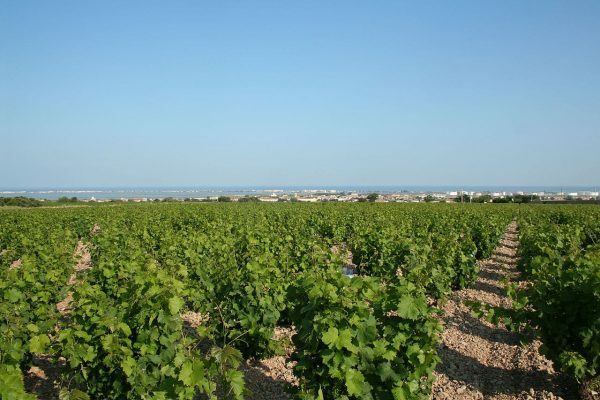 5 / 5 Muscat de Frontignan In Frontignan, the vines are planted between the lagoons of Vic La Gardiole and Thau. They represent the largest planted area of muscats in the region. Muscat de Frontignan wine is usually deep gold in colour with golden highlights – an enticing glow. Its nose is characterised by clean, intense aromas of dried fruits such as apricot, exotic fruits (including lychee), citrus and white flowers. This full-bodied wine is rich on the palate with a nice balance of alcohol, sugar and acidity, a persistent aromatic make-up and good length on the finish.